Deutsche: "Every Fed Tightening Cycle Creates A Crisis"
... but it also hints at what fed funds rate (and thus "when") the next crash will happen. 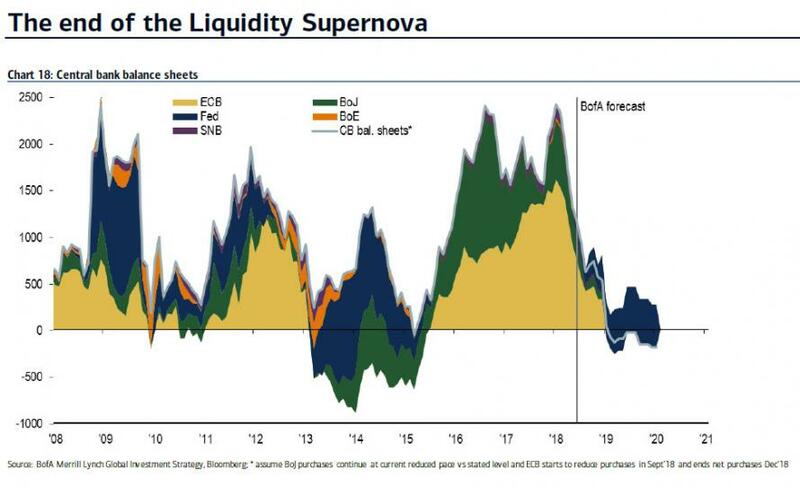 Another favorite charts is this one, also from Hartnett, which shows that the liquidity supernova which has been the sole driver behind one of the longest artificial "bull markets" in history, is rapidly fading and when the world central bank balance sheets peak in mid-2018, they will then start contracting resulting in an explosion in volatility as an entire generation of traders has no idea how to "trade", i.e. sell in addition to buy, in the absence of training wheels. The result is a 100% guaranteed crash, the only question is when and how severe. While this assessment may be simple, it is also correct, as a whimsical overnight essay by Deutsche Bank's chief macro strategist Alan Ruskin notes, in which among many other things, the Deutsche Banker says what are arguably the 8 smartest words in finance: "we should not over complicate the macro picture." So what does one get when one simplifies all the unnecessary noise? A starting point should be that every Fed tightening cycle creates a meaningful crisis somewhere, often external but usually with some domestic (US) fall out. Fed tightening can be likened to the monetary authorities shaking a tree with some overripe fruit. It is usually not totally obvious what will fall out, but that there is ‘fall out’ should be no surprise. Going back in history, the 2004-6 Fed tightening looked benign but the US housing collapse set off contagion and a near collapse of the global financial system dwarfing all post-war crises. 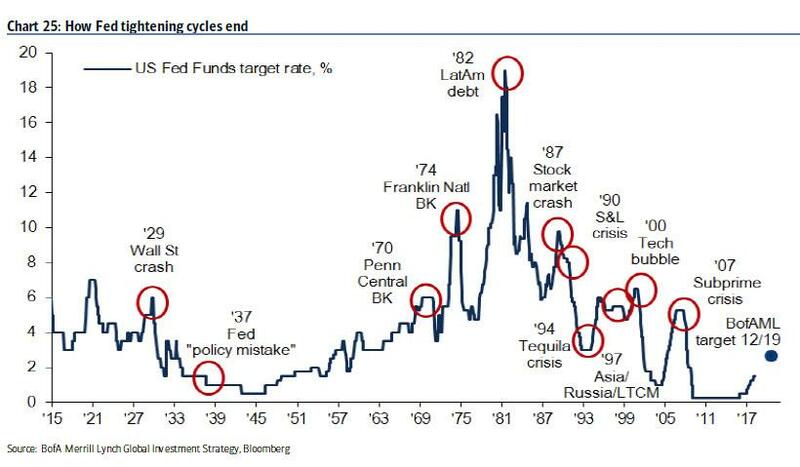 The late 1990s Fed stop start tightening included the Asia crisis, LTCM and Russia collapse, and when tightening resumed, the pop of the equity bubble. The early 1993-4 tightening phase included bond market turmoil and the Mexican crisis. The late 1980s tightening ushered along the S&L crisis. Greenspan’s first fumbled tightening in 1987 helped trigger Black Monday, before the Fed eased and ‘the Greenspan put’ took off in earnest. The early 80s included the LDC/Latam debt crisis and Conti Illinois collapse. The 1970s stagflation tightening was when the Fed was behind ‘the curve’ and where inflation masked a prolonged decline in real asset prices. Lest we think there is nothing going on and the Fed has hardly tightened, that is true when it comes to the funds rate, but: i) tightening is coming after extreme and prolonged accommodation; ii) it is taking forms we do not fully understand as major Central Bank balance sheet expansion shifts from 2 trillion USD a year asset expansion to shrinkage in the next year. iii) the US already has the highest 2y, 5y, 10y nominal and real interest rates in the G10 world - a phenomena last mirrored in the great USD boom cycle of 1983-84 when it just so happens the US was pursuing considerable fiscal accommodation and tight monetary policy that was also unique in the G10 world. The simple point is vol (domestic measures like the VIX and more ‘external’ measures like the CVIX) will take on many forms, but it has a strong pattern of following the Fed by 18-24 months when the Fed raises rates. As an example, at the moment there are a host of idiosyncratic stories in EM that look to be largely tangential victims. Where the US rate cycle is relevant is that the past extreme external policy accommodation can no longer mask domestic issues including valuation extremes like compressed credit spreads. That the USD was going down initially as US rates went up also gave the appearance that ‘this time is different’ and a benign Fed tightening cycle would ensue. So far, US-specific risk, including apparent risky spots in HYG, have held up comparatively well. In current circumstances, this good US asset news is actually bad news for select (over-ripe) assets abroad because it emboldens and frees the hand of the Fed to shake the tree more. In this regard, USD strength is finally tightening domestic financial conditions in the US a little, and is a necessary (but as yet not nearly sufficient) condition to slow the Fed down. A reminder that our note from last September suggested that financial crises have been a very regular feature of the post-Bretton Woods system (1971-) and that based on history we’d be stunned if we didn’t have another one in some form or another by around the end of this decade/turn of the next one. The most likely catalyst was the “great unwind” of loose monetary policy/QE around the world at a time of still record debt levels. We would stand by this and I suppose the newsflow and events this year so far makes me more confident of this even if we’re still unsure on the timing or the epicentre.